The Jazz Corps was a hard driving quartet heavily influenced by Ornette Coleman. These first recordings show a Spirit driving beyond musical boarders and groovin' hard. In the Fall of 1963, a few of my friends and I recorded some of my new music. Inspired by President Kennedy and his creation the Peace Corps, I called the group the Jazz Corps. Jazz without borders is true Freedom. We stretched-out to the great beyond and found new avenues of musical expression. 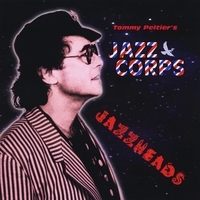 Forty - seven years later those first recordings of The Jazz Corps are being released for the first time entitled “Jazzheads”. Orchestra arrangements were added in 2009.